Corrugated metal pipe has been used in drainage applications in the United States since the late 1800’s. For most of the 20th century, the two most frequently installed stormdrain pipe materials were concrete pipe and galvanized corrugated steel pipe. For instance, there are ~65,000 stormdrain pipes in Gwinnett County’s GIS database with installation dates between 1941 and 1995. About 17,000 of the pipes are concrete pipe (~27%) and about 45,000 of the pipes are galvanized or asphalt coated galvanized pipe (~70%). How have these materials performed over time? Every stormdrain pipe material has recommended applications and environmental condition restrictions. Out of all these corrugated metal pipe products, galvanized steel pipe (zinc coated) is the most sensitive to environmental conditions. Compare the allowable pH range for galvanized steel pipe (minimum 6.0) vs aluminized type 2 steel pipe (minimum 4.50). The pH system is a logarithmic scale, so a 1.5 lower pH value translates to an environment that is ~30 times more acidic. The USDA Natural Resources Conservation Service provides soil survey information online, which allows you to select an area of interest and download the expected soil and water characteristics based on the recorded soil surveys. Let’s look at the soil conditions in the Atlanta area, using Gwinnett County as an example again. If you select Gwinnett County as an area of interest and pull up the “Soil Chemical Properties”, then you can select pH values and download a table of the expected soil types and pH values. You can download the information as a PDF report (USDA Expected Soil pH Values – Gwinnett County). We have summarized the USDA information below. If you compare the USDA information to the recommended environmental conditions for galvanized steel pipe, then you can see why the material is underperforming in the Atlanta area. Galvanized CMP should be installed in environments with a pH of 6.0 or higher, but just 1.5% of Gwinnett County falls within that range. Aluminized CMP is recommended for environments with a pH of 4.5 or higher, so none of the USDA’s expected environmental conditions fall outside of the recommended range for aluminized steel pipe. Why Does Aluminized Type 2 CMP Perform Better in More Aggressive Environments Compared to Galvanized? 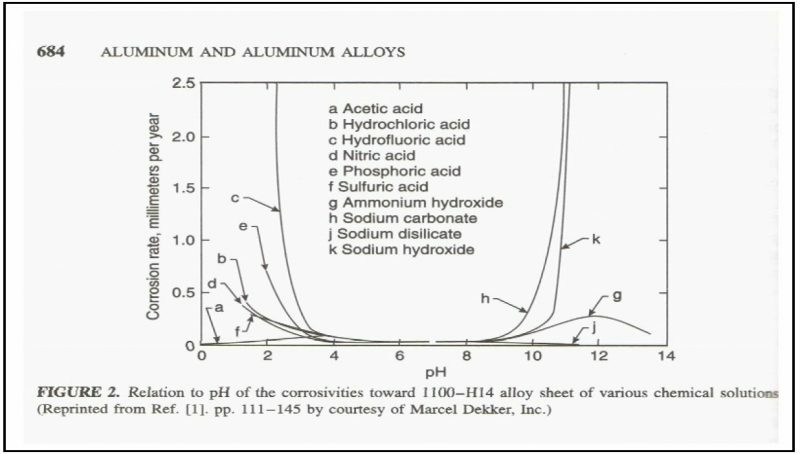 Aluminum and aluminum alloys are very stable when they are exposed to an environment with pH values between 4.0 and 9.0. Included below is a chart from Uhlig’s Corrosion Handbook. Field measurements of pH may vary, so the industry leaves some safety cushion in the recommended environmental conditions for AT2 CMP, so the recommended lower pH limit is 4.5 instead of 4.0. How Do We Know That Aluminized CMP will Outperform Galvanized CMP in Georgia? Let’s start with some visual comparisons of aluminized CMP and galvanized CMP installed at the same time and in the same environments. The image below is a pipe that was manufactured partially from galvanized steel and partially from aluminized type 2 steel. The pipe was left in service for 30 years and then examined. The visual difference between the two materials is dramatic. One of the easiest places to compare the performance of galvanized and aluminized CMP is at a headwall connection. Most precast headwalls are manufactured with a galvanized CMP stubout, so when an aluminized type 2 CMP pipe is connected to the headwall then you can see a direct comparison of the products. This pipe is located in Barrow County, Georgia. It was 17 years old at the time the picture was taken. The galvanized stubout is beginning to fail at the invert but the aluminized pipeline is performing well. The red coloration you can see in the pipe invert was easily removed with a brush and the pipe surface still has a silver sheen because of the intact aluminum coating. 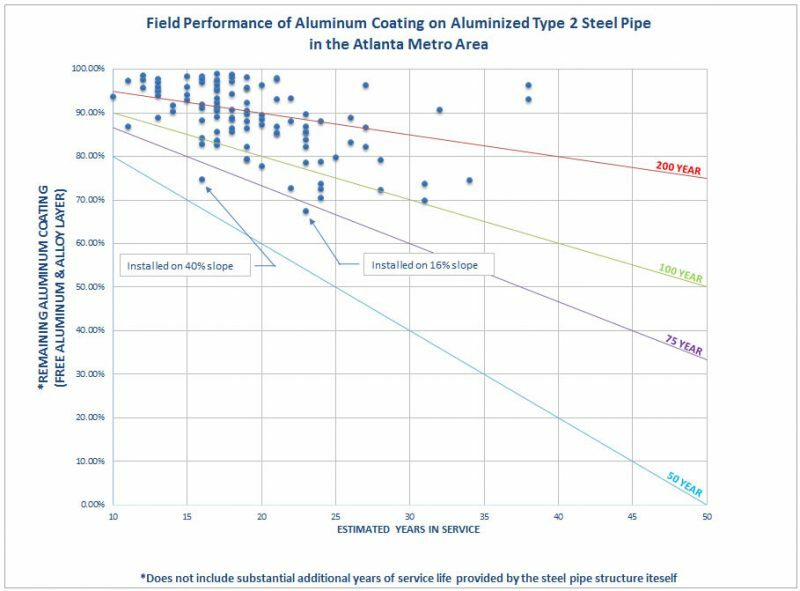 The aluminized pipe was measured as part of the NCSPA’s Atlanta area study of AT2 CMP. This pipe still had more than 90% of its aluminum coating remaining when this picture was taken. The next visual is a video that was published by Contech Engineered Solutions. 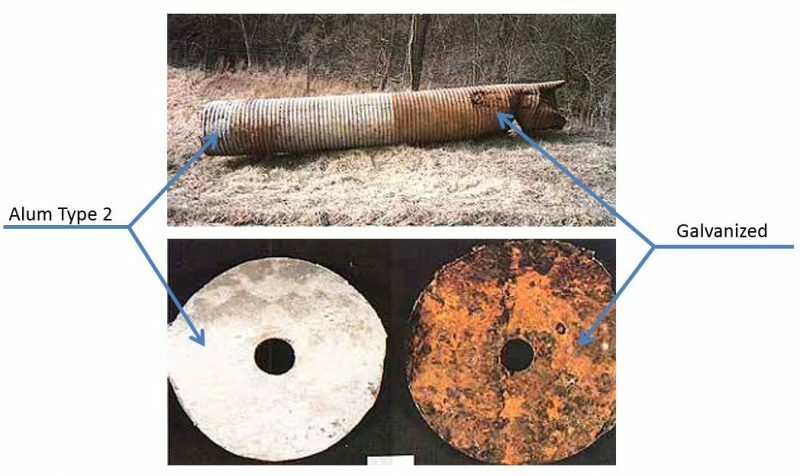 They examined a 30-year old installation where a 78” diameter aluminized CMP culvert is outperforming the galvanized end section that is connected to it. What Information is Available on the Real-World Performance of Aluminized Type 2 CMP? Aluminized type 2 corrugated steel pipe has been around since the early 1950’s. The product has been thoroughly studied for decades. “Currently, there are more well defined methods to estimate the service life of steel culverts than any other type of material” (page 57). Minnesota DOT published a report in 2013 titled “Improving the Selection and Testing of Culvert Pipe Materials”. They recommend using aluminized type 2 CMP because its service life is 3 to 8 times better than galvanized CMP. A research team at the University of Minnesota presented to MDOT in 2013. The presentation was called “Culvert Pipe Materials and Durability: Making the Right Selection for Minnesota”. The research team examined the DOT’s culvert inspection database to see how various pipe materials are performing. They recommended replacing galvanized CMP with aluminized CMP because of the better service life. Interestingly, they also state that 18% of the RCP in Minnesota DOT’s database has joint separation issues. Gwinnett County has been assessing the condition of their existing stormdrain pipe infrastructure since 1999. Each pipeline was inspected and assigned a condition rating of “Good”, “Fair”, or “Poor”. This condition data was updated in their publicly available GIS database until 2006. The database includes more than 145,000 pipelines and lists the pipe material, location, estimated date of installation, and pipe condition. The information in the database is summarized in the tables below. 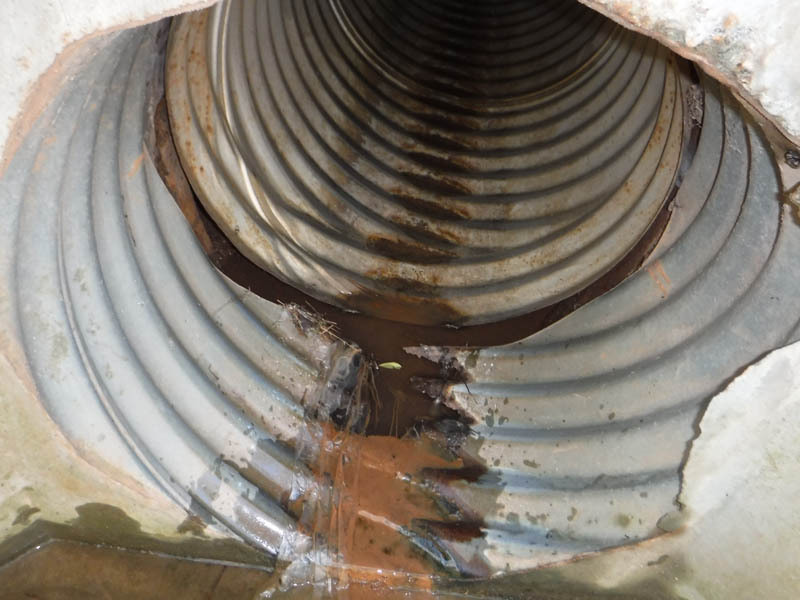 The condition data was gathered internally by Gwinnett County for their own maintenance planning purposes, but the summary tables below were compiled by Southeast Culvert. When the data is broken down by pipe material type, you can clearly see the performance differences among various material options. The worst performing pipe material in the database is galvanized CMP. Bituminous coated galvanized CMP is performing significantly better than galvanized. RCP is middle of the pack. It’s doing better than galvanized and BCCMP, but worse than HDPE and aluminized type 2 CMP. HDPE pipe is the second best performing material in the database. Aluminized type 2 CMP is the top-rated material by a significant margin. The install dates for the database go back to 1941, so let’s look at the statistics for the oldest installations. Narrowing the time frame to the period between 1941 and 1995 reduces the number of pipelines to ~65,000. The performance differences between the various material types also becomes more pronounced. Galvanized CMP is clearly performing worst with ~9% of the galvanized pipes in “poor condition”. RCP, BCCMP, and HDPE are all in the same ballpark, around 3% in “poor condition.” HDPE is performing the best in that group. Aluminized type 2 has the most pipes in “good condition” by a large margin (27% vs < 10% for the rest of the materials). It also has the least proportion of pipes in “poor condition” (~1%). Cobb County has a GIS database that is comparable to Gwinnett County. The number of inspected facilities was smaller as of 2016, but the statistics are similar. The condition data was gathered by Cobb County for their own maintenance purposes, but the summary tables below were compiled by Southeast Culvert. Cobb’s statistics show a similar pattern as Gwinnett County. Aluminized Type 2 CMP has the smallest proportion of pipes in failed condition and the largest proportion in good condition. HDPE is the second best performing product. Uncategorized CMP is the second worst performing category, which could include plain galvanized CMP, AT2 CMP, and BCCMP. RCP is the worst performing product in Cobb’s statistics by a large margin. Let’s look at some of the older pipe in Cobb’s database. When the data is filtered for install dates between 1980 and 2000, the number of pipelines drops to ~7,000. The older pipes show a similar pattern. Aluminized CMP is the best performing product. BCCMP, Uncategorized CMP, and HDPE are middle of the pack, and RCP is the worst performing pipe material. Within the recommended environmental conditions, the expected service life of aluminized type 2 CMP is 75 years minimum for 16 gauge pipe and 100 years minimum for 14 gauge pipe. Galvanized CMP has an average service life of 40 years in the recommended environmental conditions (which are not commonly found in Georgia). Because of the performance differences between the products, most DOTs in areas with lower pH environments use aluminized CMP instead of galvanized. 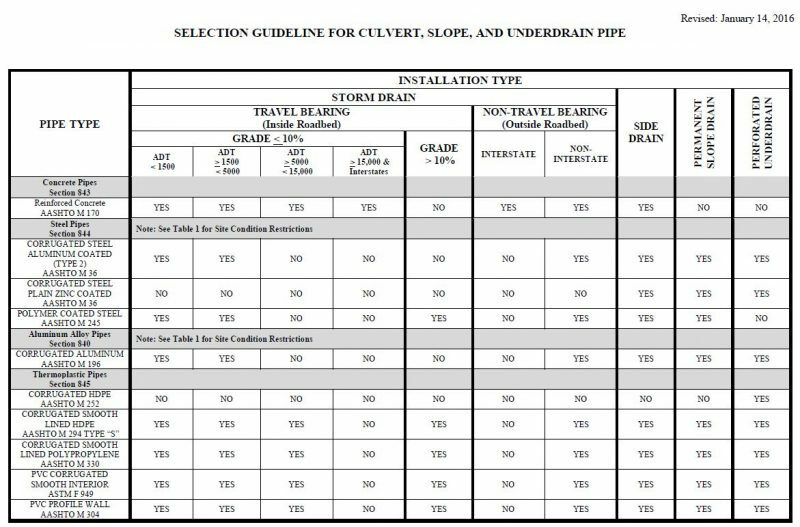 The Georgia Department of Transportation updated their stormdrain standards in 2016 and revised their stormdrain pipe selection chart. They upgraded the use of AT2 CMP to be allowed underneath roads with an expected traffic of 5,000 cars per day. GDOT uses a 75-year min service life guideline for pipe materials underneath a road. Notice that galvanized (zinc coated) CMP is not allowed inside the roadbed on GDOT projects. The Oregon Department of Transportation explicitly lists the service life expectations for their stormdrain products in the ODOT hydraulics manual. Galvanized CMP is listed with a service life between 15 and 40 years depending on the environment. Aluminized CMP, RCP, and plastic pipe are all listed with a 75-year service life. Aluminized type 2 has been studied on an ongoing basis since the early 1950’s. More than 125 AT2 CMP pipes were installed in coordination with 20 state and county DOT’s and revisited every 10 to 15 years for an updated performance report. The most recent durability study was published by Elzly Technology Corporation in 2014 and included pipes that have been in service for 60 years. The conclusions of the study support the 75-year minimum service life for 16 gauge Aluminized Type 2 CMP in culvert applications. Culvert applications are significantly more aggressive than storm sewer applications because of bedload conditions. Storm sewer applications are considered to have little or no bedload according the FHWA guidelines. In stormdrain applications, the 75-year minimum service life guideline for AT2 CMP is very conservative, which is why the next study’s results are so dramatic. 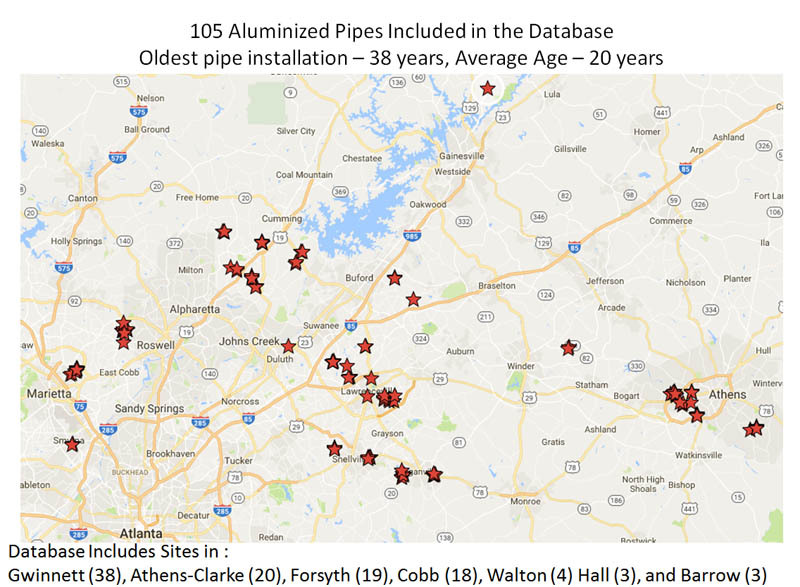 In 2015 the NCSPA began building a database of aluminized type 2 CMP installations in the Atlanta area. Over 100 pipes were inspected and measured for aluminum coating loss and the results were charted against the expected wear rates for the material to provide a 75-year service life. The study locations were widely scattered across north Atlanta. Most of the pipes have been in service for more than 20 years at the time of inspection. The results of the study show that AT2 CMP installed in stormdrain applications will provide a service life far in excess of 75 years. The average wear rate of the aluminum coating was 0.84% loss per year. At that rate, there will be substantial aluminum coating on these pipes after 100 years of service. The average coating wear rate for the pipes that have been installed for more than 30 years was 0.78% loss per year, which shows that the aluminum coating provides consistent protection even after decades of service. You can find the full report on the NCSPA’s Studies and Reports webpage. For most people, the distinction between the many types of corrugated metal pipe is blurry. Contractors, engineers, and municipal reviewers often have an opinion on the product as a general category. A reviewer might say “we allow metal pipe” or “we don’t allow metal pipe” for a project, but the specific type of CMP material makes a big difference on the expected service life of the pipe. Aluminized type 2 CMP has proven to perform very well in Georgia conditions, which is why it is allowed underneath major roads on Georgia DOT projects and in many Atlanta area municipalities. If you are specifying a CMP product on a project in Georgia, then mostly likely you should use aluminized CMP. Let us know if you have a question about whether the pipe is appropriate for a specific application on a project, or if you have any questions about CMP or HDPE products.